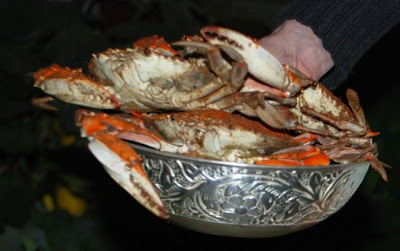 My friend Wendy's birthday was this weekend, she is from the east coast, and loves blue crab, so I ordered a bushel of them to have for dinner. 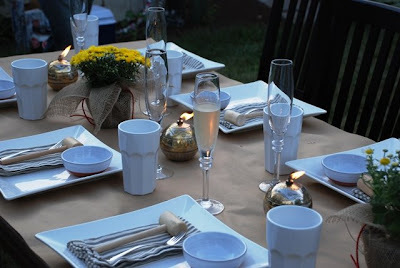 This party was so much fun, we sat outside, and had crab, a citrus and avocado salad, hush puppies, corn on the cob, and a yummy carrot cake (I'll post all these recipes very soon). I made a horseradish aioli to go with the crab, but we just ended up eating the crab plain or with a little melted butter. 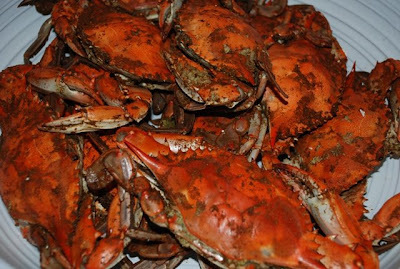 Since the crabs were being flown from the east coast I ordered them pre-cooked so all we had to do was steam them for a few minutes to warm them up. We had so much fun sitting around the table, pounding the crabs with a mallets and sipping champagne. I shouldn't have ordered so many crabs though, we only ate our way through half of them! The table looks beautiful! I love the candles. Flying in crab for your friends birthday? You are my kind of friend! 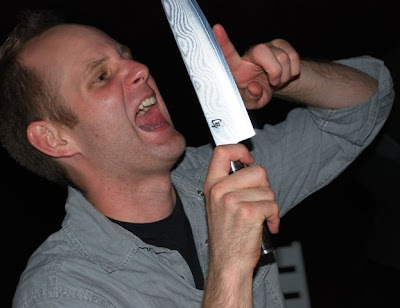 Looking forward to the other recipes. Every time I visit my cousin in Maryland, I make him go out for crabs. The restaurant covers the table with brown paper, and dumps crabs in the center of the table. You get a mallet and a nutcracker, and lots of napkins!